Opens with a subtle sherry nose, accompanied by plenty of juicy oranges, baked apples, and hints of bananas. Little honey, fine vanilla and a touch of cinnamon in the background, along with subtle oak and a whiff of white pepper. Elegant and mellow! Sweet and malty start on the palate with typical sherry-derived flavours - dates, figs, and dried apricots, along with juicy oranges. This is complemented with a warming spiciness of black pepper, ginger, nutmeg and fine oak. Deliciously mouthfilling! Lovely notes of vanilla and raisins emerge, nicely intermingling with lingering dark chocolate and a touch of marzipan towards the finish. The finish is long, creamy with honey, malted barley and vanilla. Fruity and syrupy with oranges, followed by a slightly warming spiciness of oak, ginger and anise on the tail. Lively on the nose after adding a few drops of water. Sherry-derived flavours and fruity notes, oranges in particular, remain while more oak spice is coming through. Still sweet and fruity on the palate with a slightly tamed but prickling spiciness of oak, pepper and nutmeg. The finish shows good length with a creamy, soft, even silky mix of malted barley, vanilla and honey. Gets slightly drier on the tail with fine oak and anise. A pleasantly surprising dram! 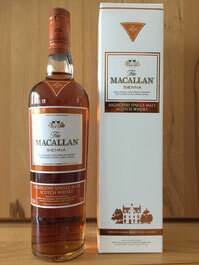 A delicate Macallan with a lovely interplay of bright, fruity notes (oranges! ), rich dried-fruit sweetness and oak-derived spiciness. Well-balanced with no sherry overload. Very savoury with a multi-layered range of flavours and textures. Smooth, and creamy with a long and warming aftertaste. Even a small drop of water works fine with this whisky.